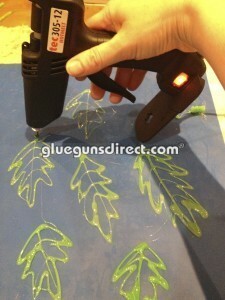 Tec 305-12 Probably the best craft glue gun available! Tec 305-12 glue gun offers unrivalled reliability, ease of use and exceptional adhesive melt rate for a glue of its size and is rapid becoming the preferred choice for the art and craft fields. Delivering a whopping 750 grms of molten glue per hour, powered by Eco efficient self-regulating heaters making the Tec 305-12 ideally suited to applications where controlled amounts of adhesive are required repetitively in model making, arts & crafts, schools and general use. 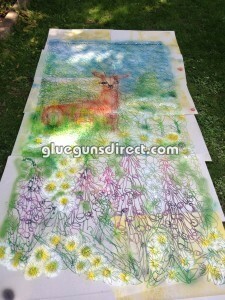 We put the Tec 305-12 to the test with the staff from the Art School in Manchester who exhibited their own work this summer at the RHS Flower Show at Tatton Park in Cheshire and used the new Tec 305-12 glue gun as a tool to create artworks. 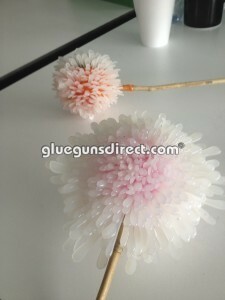 Some used the glue gun in the traditional way as a means of sticking things together, which made life a lot easier! 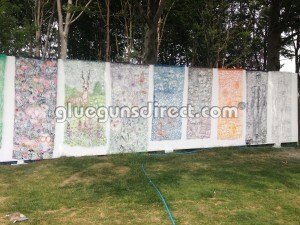 – whereas others used the glue gun to make the artwork itself. The work produced was exhibited at the RHS Flower Show at Tatton Park and at the Whitworth Weekender at the Whitworth Art Gallery last summer and create a lot of attention and interest. The Tec 305-12 is rapidly becoming a firm favourite within arts and crafts from homeworkers to schools and universities. The narrow profile of the Tec 305-12 aids visibility, allowing the molten Tecbond adhesive to be placed with high accuracy and is ideal for bonding delicate items such as sequins and diamante bonding when used with Tecbond 132/12/300 glue sticks. We offer two versions of the Tec 305-12 glue gun, Low Melt or Hot Melt, suited for either hot melt or low melt adhesives. You can find out more about the difference between hot melt and low melt adhesives. Low melt version of the Tec 305-12 includes 10 free sticks of Tecbond LM44-12 and the hot melt version includes 10 free sticks of Tecbond 132-12 glue.